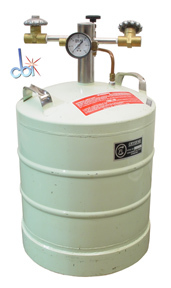 In addition to this Cryofab CFPB-25-84, Capovani Brothers Inc. stocks a wide range of used cryogenic dewars. Typical manufacturers include Airco, Cryofab, Linde, MVE, and Taylor-Wharton. dewars provide the ultimate in convenience and transfer efficiency. especially if it is a large volume of liquid. This feature is self contained and completely eliminates the need for any external pressurization attachments and equipment. maintain any required pressure from 7 to 25 PSIG.